This post is about implementing feature toggle in ASP.NET Core. A feature toggle(also feature switch, feature flag, feature flipper, conditional feature, etc.) is a technique in software development that attempts to provide an alternative to maintaining multiple source-code branches (known as feature branches), such that a feature can be tested even before it is completed and ready for release. 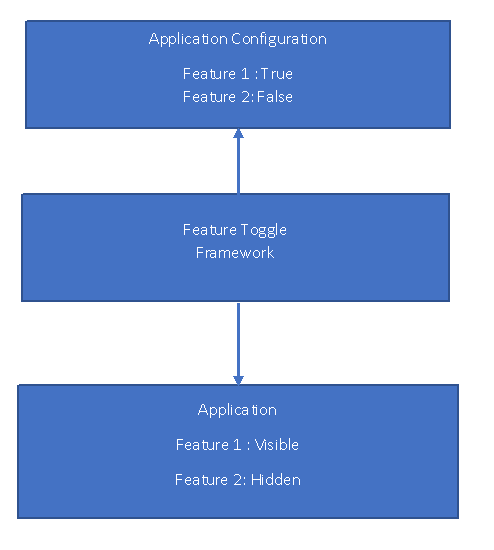 Feature toggle is used to hide, enable or disable the feature during run time. For example, during the development process, a developer can enable the feature for testing and disable it for other users. So basically a feature toggle is something like controlling features based on the configuration file. So in the configuration file you can mention which all features you need to turn on, application will read the configuration and hide the features or UI elements. This is very simple and minimal implementation. I am using the appsettings.json to configure features. This is my appsettings.json file. In this I have two features, Carousel and Navigation. And I am disabling the Carousel and enabling the Navigation feature. Next I have created a IFeature interface, with IsFeatureEnabled method, which will read the configuration file and returns bool. And here is the implementation of IFeature interface. In this I am checking whether a configuration value available, if yes, will parse it to boolean and returns. If the feature is not available in the configuration, it will throw a FeatureNotFoundException. If you want to read from database or any other configuration file, you need to modify the implementation. You can inject the class to the controllers via ASP.NET Core DI, like this. Instead of writing the code directly in ConfigureServices method, I created an extension method to encapsulate it. And you can use it in ConfigureServices method like this. Now you have completed the implementation part, you can consume it in the code like this. In ASP.NET Core View’s you can do similar way. First you need to inject the IFeature to the view and you can consume it. Instead of injecting the IFeature on every view, you can inject it in _ViewImports.cshtml file and all the view files can access it. Here is the _ViewImports.cshtml file. I am not a big fan of mixing HTML and Razor C# code together. In ASP.NET Core, you can implement Tag Helpers to fix this problem. So you don’t need to inject the IFeature in views. Here is the Favorite tag helper, which will again IFeature will be injected to the TagHelper constructor and in process method based on the condition check the tag will be render. And you need to add the Tag Helper in _ViewImports.cshtml file. And you can consume it in Views like this. You can modify the IFeature.IsFeatureEnabled implementation to use it with Database or any other configuration source. You can also implement some business logic if required, like based on tenant or based on region / country, you want to enable or disable features.